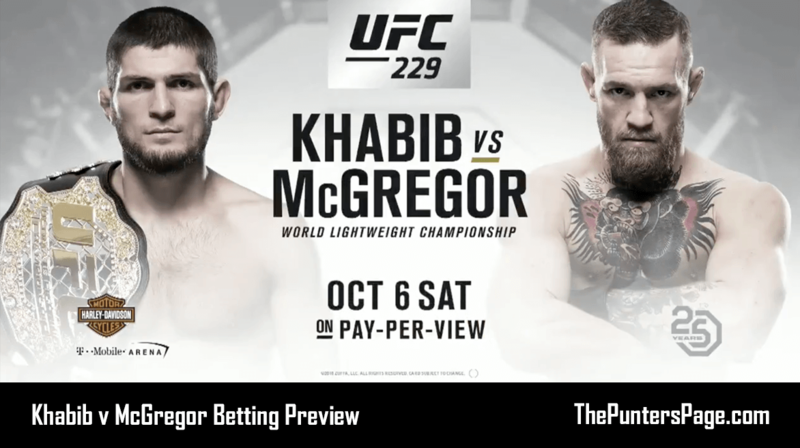 Alex Boardman (@A_Boardman) previews the UFC 229 fight between Khabib Nurmagomedo and Conor McGregor and provides us with his best bets for Sunday’s hotly anticipated clash. Former two weight champion Conor McGregor returns to the UFC this weekend when he takes on the current undefeated lightweight champion Khabib Nurmagomedov in a bout that will solidify the undisputed champion at 155lbs. The last time we saw Conor McGregor fight under the UFC banner, he took out then lightweight champion Eddie Alvarez in emphatic fashion, claiming his second UFC title in the process and becoming the first man to simultaneously hold multiple titles within the UFC. This, however, was back in 2016, and since then we saw something we never thought we’d see, a UFC fighter, under contract, compete in a professional boxing bout. McGregor traded the four-ounce gloves for 10, the octagon for the ring, and 5 x 5 minute rounds for 12 x 3; and took on the best boxer of the modern era, Floyd Mayweather. The bout was interesting to say the least, but ultimately McGregor came up short, yet walked a way with a life-changing amount of money. So much so, that many questioned whether McGregor needed, or even wanted to return to the Octagon again. Whilst the circus of the McGregor/Mayweather fight was taking place, the UFC needed to get its lightweight division moving again. The UFC paired up Khabib Nurmagomedov and Tony Ferguson to fight for the Interim lightweight title at UFC 209, with the winner scheduled to take on Conor McGregor at a later date. This was the third time the bout had been scheduled between the pair, but again, it fell through as Nurmagomedov had to pull out through a weight cutting issue. The bout was scheduled again later in the year, but yet again fell through due to an injury, this time to Ferguson, seemingly putting the bout at risk for good. The cancelation brought forward a new opponent for Khabib to face, and at UFC 223, Nurmagomedov defeated Al Iaquinta via unanimous decision. When it was announced McGregor would be returning to fight in the UFC, it was clear him and Nurmegomedov would be on a collision course for the title, which was quickly confirmed when the pair signed to fight at UFC 229. The bout is mired in bad blood and a strong mutual disliking of one another, which stems back from an altercation in New York, where McGregor smashed up a bus with Nurmagomedov on in retaliation of Khabib’s actions towards one of Conor’s teammates. Most pundits have this fight as a pick your preference. Some favour the grinding, relentless, sambo-wrestling hybrid style brought by Khabib, which has formed the cornerstone of his undefeated, 26-0 MMA record. Others believe Conor’s standup is too great for the stiff, robotic Dagestani native, whose troubles in his fights have all stemmed from the stand up element of MMA. Conor’s weakness is Khabibs strength, and vice-versa, so the bout will be based around who can neutralise the others strength, whilst creating their own opportunities to implement their game plan.